A group of leading Republicans, including former secretaries of State and Treasury, have called for a carbon tax on fossil fuels, and they even had a meeting last week with President Trump, whose own Secretary of State, Rex Tillerson, also advocated a carbon tax while running Exxon. The president himself hasn’t weighed in on the issue, and Congressional Republicans don’t seem enthused, but it’s a proposal we should all be reading. 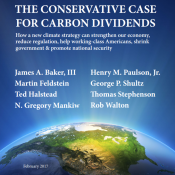 11 February 2017 | Earlier this week, a group of prominent Republicans called for a nationwide price on carbon to reduce greenhouse-gas emissions and slow climate change. It’s a proposal we should all be talking about, but we know Congress won’t – at least not before 2018 –because while these elder statesmen of the Republican party were floating the paper, their juvenile progeny in the Senate were voting to let US oil companies pay bribes overseas and stifling any mention of the $20 billion per year in subsidies and tax breaks that the US gives the fossil-fuel sector. Still, the proposal exists, and it may revive the only debate we should be having now: not if we should have a price on carbon, but how to determine it and what to do with the proceeds. Here’s a primer to help you along. Carbon pricing makes us pay for the damage our greenhouse-gas emissions impose on the rest of the world, on the premise that if we have to pay for it, we’ll reduce it – a premise that even free-market icon Milton Friedman endorsed. Carbon markets go a step further – moving money from those of us who emit to those of us who reduce emissions, as we’ll see in a bit. Before the election, many assumed the United States would have a price on carbon, and 95% of economists familiar with climate change say such pricing is the most efficient and flexible way to cut greenhouse-gas emissions. That’s almost as high as the 97% of climate scientists who say man is most definitely causing climate change. Unfortunately, science isn’t held in high esteem among today’s Republican leadership – but it was in the past, and hopefully it will be again. If carbon pricing is new to you, check out “How A Carbon Price Can Ease The Climate Shock” on Ecosystem Marketplace, or listen to the first edition of the Bionic Planet podcast, which is available on iTunes, TuneIn, Stitcher, and elsewhere. In the United States, Democrats tend to argue for environmental protection on moral grounds, while Republicans tend to argue against it on economic grounds. Neither party really gets it right, because they both – at best – see environmental protection as something we should do – like a bit of housekeeping, akin to trimming the bushes – as opposed to something we must do – like shoring up the foundation, which is what it is, because our entire economy depends on nature. This is something that true fiscal conservatives have always understood, which is why they spearheaded the development of ecosystem markets that bring the true cost of environmental degradation into our economy. It was hunters frustrated by dwindling supplies of ducks who first began to advocate for wetland protection through organizations like Ducks Unlimited, and it was President George H W Bush who championed and signed the first cap-and-trade mechanism as part of the Clean Air Act of 1990. That law put a cap on the amount of sulphur and nitrogen oxides (SOx and NOx) that industry can pump into the air, but it let the private sector identify the most efficient way of meeting that cap. Then as now, right wingers went apoplectic – predicting everything from rolling blackouts and soaring energy costs to the end of the coal sector and a nationwide recession. Left wingers had the opposite fear – they believed industry would just “buy its way out” of its clean air obligations, and likened the permits to indulgences. Both sides were wrong. The program has helped cut acid rain in half since its inception, and at a cost of just $3 billion per year, which is more than 85% lower than industry projections. More importantly, it saved local communities more than $122 billion per year in reduced health costs and cleaner lakes and rivers, according to a study by the Journal of Environmental Management. That’s $40 in savings for every $1 spent – although the EPA prefers the more conservative claim of $30 for every dollar spent. The new Republican proposal isn’t cap-and-trade. It’s a carbon tax. They’re similar, but different: cap-and-trade puts a cap on the amount of greenhouse-gasses that can be emitted and lets the market find the most efficient way to meet that cap, while a carbon tax puts a price on emissions and assumes companies will reduce emissions as a result. Under cap-and-trade, emitters either buy or are given carbon credits for the right to emit greenhouse gasses. If their emissions exceed their credits, they have to buy more from someone else – or trade for them. Carbon credits come in two forms: either allowances, which are given away or auctioned off by the government; or offsets, which are created by reducing emissions somewhere else – by planting trees, saving endangered forest, or developing a wind farm. All programs to-date use a blend of free allowances, auctioned allowances, and offsets. Under California’s cap-and-trade program, for example, the government gives away a certain number of allowances, auctions off others, and allows for offsetting. Money from the auctions goes into environmental improvement and poor communities, while groups like the Yurok indigenous people generate offsets by intensively managing their forests to absorb carbon dioxide from the atmosphere – something that owners of farms and private forests across the country earned $63.2 million by doing in 2015, according to Ecosystem Marketplace’s most recent State of Forest Finance Report. That amount could grow exponentially, because the country’s forests, farms and fields absorb about 850 million metric tons of carbon dioxide every year, which means they remove about 16 percent of the greenhouse gasses that the energy and industrial sectors are generating. With the right incentives, land systems can offset up to half the country’s emissions by 2050 – putting tens of billions of dollars into the pockets of farmers and forest owners who maintain the giant carbon sink. Under cap-and-trade, market forces both determine the carbon price and direct at least some of the money to the most cost-effective solutions. Under a carbon tax, the price is set by the government. The new Republican proposal isn’t cap-and-trade. It’s a tax – specifically, a tax on greenhouse-gas emissions associated with fossil fuels. That means money would flow into the government rather than to projects that actively reduce emissions. Being a Republican proposal, the money wouldn’t stay in government, but would instead flow back out to the American people in the form of a tax rebate, and the price would rise incrementally over time. As that happens, the authors argue, the Trump administration can “repeal and replace” the complex and clunky Clean Power Plan. All true, but let’s not forget that the Clean Power Plan wasn’t Obama’s first choice. He wanted cap-and-trade and only cobbled the Clean Power Plan together after Republicans balked at putting a price on carbon. Structuring the tax as a rebate to the American people is a really interesting concept. Given the benefits of the carbon tax as mentioned here — http://capitolstartup.com/why-a-carbon-tax-is-pro-business-and-pro-innovation/ — it seems the rebate pushes it over the edge to make it truly bipartisan.